AdMarker offers a unique opportunity for webmasters to monetize a previously untapped space on their websites in order to maximize revenue. For publishers, AdMarker delivers an unobtrusive system that integrates into your website’s images to deliver contextually relevant advertisements to your visitors. This provides publishers a solution to offer an innovative new way of engaging their audience and driving more revenue. If you’re a webmaster, then you’re likely already familiar with Google Adsense, which is the most common method used to monetize content and fill empty space for publishers, but webmasters are often looking for more relevant, less intrusive ways of boosting on-site revenues. AdMarker’s program could be loosely described as “Adsense for images” since it utilizes the unused space in your website’s images for monetization rather than content space. 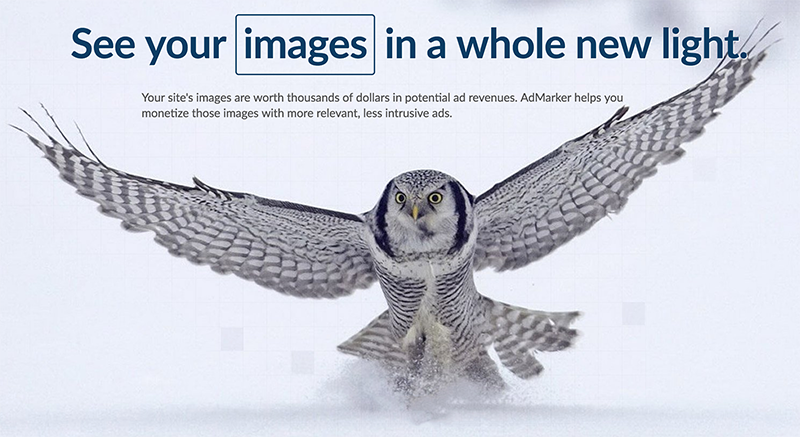 The AdMarker system is powered by proprietary image recognition software that’s constantly at work deconstructing and tagging images to match them up with the most relevant ads. It’s also integrated with a number of major RTB providers and ad servers. While AdMarker offers a range of in-image ad types, its signature style comes in the form of a pulsating pin. This discreet embedded icon aims to entice readers to engage without forcing them to view an advertising message. They then have the option to interact with the image and access pertinent embedded content by simply mousing over or clicking on these various icons. When users are ready to exit the pop-ups, they can do so with a simple click or move of the mouse. In-image advertising platforms are relatively new when compared to traditional website monetization programs, but with the internet becoming more media driven every year, publishers would be wise to research this onsite revenue driving strategy. As an example of AdMarker’s in-image pin ad, you can see the picture below as how it can appear on your website. The default icon for a user to click/hover their mouse over is a star that can be placed in a convenient location on your image. This icon will, in turn, attract a user’s attention and entice them to hover over it. At that point, AdMarker’s program will initiate a pop-up that will display a video or image advertisement relevant to your page’s content. AdMarker offers an easy way for publishers to enter the image advertising market and unlock a previously untapped source of revenue. This innovation gives new or established publishers a great way to experiment with a more unobtrusive method of monetizing their website, which may be a better fit for sites that rely heavily on images or other media forms. What We Like: Unique way of taking advantage of a previously unused space on your website, multiple ad designs to fit your image, no cap on earnings, simple to use control panel, readily available customer support. What We Don't Like: Lower amount of ad unit solutions for entire page content. Payment Methods: PayPal, wire transfer or direct check. Earnings Expectations: US based publishers can expect to see eCPMs of $0.8-1.2 with a 60% fill rate. UK publishers can average $0.6-1 eCPM with a fill rate of 50%. Company Information: AdMarker, formerly known as PopMarker, is an in-image advertising platform based in New York City, NY. Founded in 2014, PopMarker has won a number of awards including the Global Innovator II Award and Long Island Software Award. AdMarker helps publishers turn their images into lucrative ad inventory to serve more relevant, less intrusive ads to their visitors. It uses sophisticated image recognition software to place the right ad in front of the right person at the right time. Experience: AdMarker has worked with a series of high-profile clients including Marie Claire, Nike, Toshiba and MTV, and CTRs of up to 3% (compared to the 0.01% industry average). Implementation is quick and easy. All that’s required from you is to add a small code snippet to your site’s HTML. AdMarker offers implementation solutions for custom websites, widgets for blog platforms (WordPress) and other content management systems. AdMarker’s system allows publishers to create and run multiple campaigns simultaneously. They offer the only visual recognition ad targeting system implemented in the market today, which will ensure that your website’s content is matched up accurately with your advertisements. Their platform offers ad targeting and campaign enhancement by enabling ads to be targeted based on the visual makeup of your web pages. This includes your page’s text and multimedia content, which their software will analyze to create an effective marketing campaign for your users. The technology that AdMarker uses gives publisher’s advertising campaigns increased reach and allows their efforts to benefit from visual data insights within your user control panel. Within your user control panel with AdMarker, you can adjust your individual campaigns and choose specific categories that match up with your website’s content. The system includes options to exclude certain keywords from your site’s title tags, domain name, or individual URLs that may contain negative key terms you wouldn’t want your ads to match up with. AdMarker also includes full mobile support for your website and ad units. Their in-image ads will conform to mobile standards so that users will still receive the full experience from their tablets or smartphones. AdMarker offers a variety of ad units that can be used either in conjunction or independently of each other. Their system focuses mainly on in-image ad platforms, which will monetize a publisher’s pictures in a way that was previously not utilized. One of AdMarker’s most common and successful (80% Viewability and 3.4% Click through Rate) ad solutions is their Pin Ad option. This solution adds a unique, customizable icon to specific positions on your images that will display an ad unit pop-up when a user hovers their mouse over it. An example of where this can be used is in the main title images at the top of your individual pages or blog posts. You can use a custom icon to draw attention to locations on the image where users can view relevant content. This option works well for a variety of different websites including blogs, news or entertainment sites. As a publisher, you may already be familiar with pop-up ads that scroll upwards from the bottom of your website’s screen. AdMarker’s in-image overlay uses a similar concept, except this ad unit includes a pop-up that will only appear underneath your image, rather than your entire page. This solution prevents the problem of covering up your page’s content as you would experience with full page pop-ups. This ad-unit will only occupy a small portion of the bottom part of your image, which will still provide users with the full experience of enjoying your media. One of the popular monetization solutions that publishers are exploring these days is a temporary page cover, which forces users to view an advertisement before they can access the actual content of your page. This type of advertising usually dims your entire page while the user views a picture or video ad. AdMarker’s image cover solution doesn’t obstruct a user’s view of your page’s content, but instead will only pop-up over your actual chosen image. This means your visitors are much more likely to be receptive towards viewing this ad unit since it’s not using the standard page-locking method. Finally, AdMarker offers the standard floor pop-up for your website, which includes a sliding banner that will appear on the bottom of your page. This is a full-length banner that will display an ad-unit that is relevant to your website’s content. This unit can be used in conjunction with in-image ad systems, which you can customize in order to take advantage of the most profitable real estate on your site. Overall, AdMarker’s ad platforms offer a viewability rate of 81% on average across their various ad systems, although with a 1.8% click through rate. A publisher can use their user control panel to manipulate various campaigns, layouts and strategies that will be most effective for your website’s subject matter. Convincing publishers to sign up is one of the biggest challenges an ad network faces. Positive independent reviews is one of the best ways to convince then to sign up. What makes AdMarker so fundamentally different from other publisher monetization solutions is their focus on non-intrusive, reader-friendly content that will create a positive experience for users. The typical thought process of an ad platform today is to force as many ad units into your website as possible and place the biggest ads in front of your user’s faces. Over time, however, web surfers have gotten wise to the typical ad schemes and layouts on websites. They recognize ads more easily, see them on a regular basis and are more likely to simply ignore them. AdMarker seeks to be more discrete in their advertising methods, and by embedding an icon within your website’s images you can offer a much smoother visitor experience. Another advantage for publisher’s using this platform is their ability to use their website’s space to better satisfy their user’s needs. Without having intrusive ad components littering a website, a user is more likely to become engaged with your content, prompting a higher level of repeat traffic. The core belief of AdMarker is to offer a publisher solution that displays content to users that they are actually going to be interested in, rather than attempt to “blanket” a website with random ad units and hope for the best. There are no tricks involved with AdMarker’s platform, reducing the need for publishers to feel like they have to “force” their visitors to click on an ad unit to maintain their profitability. Admarker’s proprietary next-gen ad system seeks to display targeted ads to users based on the specific content of a publisher’s images and content. Whether you are using a custom web page design or a blog format, AdMarker’s software will analyze your uploaded images and apply relevant ad units to your website’s subject matter. They use a unique image recognition system that runs in real time, so it can keep up with any image changes you may be making on a regular basis. The program then finds the best advertisement within their system to pair with your images, making for much better user interactions. Although they are a fairly new enterprise, AdMarker offers some innovative new solutions that should attract the attention of any publisher. Easy to reach customer service: AdMarker’s reps are easy to reach either by phone, email or online chat. They will respond to your questions quickly, unlike many advertisers who need to be sent multiple emails before hearing back from them. There are a ton of monetization networks out there, but few that offer really exceptional customer service. Customizable Ad Relevance Tools: If you’re currently using ad networks as a way to monetize your website, you know how frustrating it can be when you’re getting completely irrelevant ads circulating. Even worse, is if you’re getting ads for your competition. AdMarker has gone to great lengths to let you customize your keywords for relevance, and it really shows in the ad output that you’ll see on your page. Smooth Site Integration: Since you may be unfamiliar with this type of marketing for images, it might be confusing at first to figure out how to implement it properly. Fortunately, AdMarker has a widget for easy integration into WordPress along with other tools for custom sites. Image Recognition Software: AdMarker has their own proprietary image recognition program that will attempt to determine the subject matter of the picture it’s using. This helps ensure that ads are not only relevant, but effective, meaning visitors have a much higher chance of clicking on them and increasing your revenue. While AdMarker offers a unique and promising new way of generating revenue on your website, there are some issues to consider. Limited Ad Layout Options: Since this monetization method is still relatively new, there are only a handful of ad layouts that you can use on your site. Most are image integration layouts, but in the future, it would be nice to have a bit more flexibility. Payment Timeframe: Currently AdMarker runs on a net 90 days payment cycle, and will generate a statement on the 3rd of every month for your previous month’s activity. It would be nice if they shortened their payment cycle to accommodate newer publishers. Can increase in your site’s bounce rate: As with any ad program, you run the risk, of sending too many visitors away from your website rather than retaining them. Since your site’s pictures are often the first thing a visitor sees, even before reading your content, they may be clicking on the image ads and navigating away from your website, preventing repeat revenue from other monetization programs you may be using. Medium Level Earning Potential: Adsense may still be the cream of the crop for revenue generation, and AdMaker’s solution likely won’t be enough on its own to support you, but it certainly has the potential to supplement your site’s income. For years the Internet has been trending towards a more media-driven layout with pictures, videos and other multimedia forms often taking precedent over actual text content since they tend to attract the user’s attention first. It seems like a no-brainer to take advantage of your image’s marketing space to help increase your site’s ad revenue. It would be well worth exploring AdMarker as either an exclusive or companion ad program for your website in order to drive user engagement and increase your revenues. Bottom line: If you are frequently using images on your website and are seeking a unique method of monetizing them, give AdMarker a try. Sign up is quick and easy, also 100% free. Try it out!